If your baby or young toddler has been struggling with multiple night wakings, short naps, early morning wake ups, your in luck!! 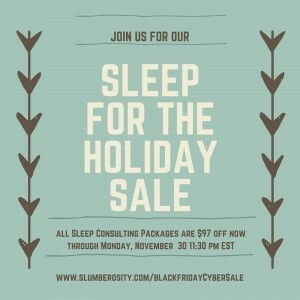 To celebrate the holidays, Slumberosity is offer $97 off all Sleep Consulting package. Sleep Conditioning (training) can be difficult process to go through on your own. You can read all the books on the market and not find a solution to your child’s sleep troubles. It’s because every child is different. By working with a Certified Child Sleep Consultant, you can help eliminate all of the guess work and get you the result you are looking for. This package is great for parents who have questions about their child’s sleep but aren’t ready to commit to a full sleep package. There is no support for this package. This is our most popular package. The Basic Sleep Package is a great option for parents who are at their wits end and feel like they have tried everything to help their child sleep. We will get to the root of their sleep troubles and then I will provide you with non- judgmental support to help you and your family get the sleep you want and deserve. Are you local to the Atlanta Area? The House Call Package might be for you. It give me the opportunity to assess your child’s sleep environment which is critical to your child’s sleep. You will also receive all of the great benefits that accompany the Basic Sleep Package.